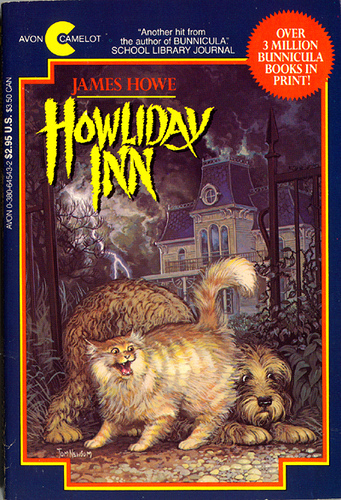 This week I figured I’d build on last Monday’s post about Bunnicula and review Howliday Inn, the next book in James Howe’s hilarious series. Unfortunately, his wife Deborah did not live to co-author this one. But the book maintains Bunnicula’s quirky style. I actually received this book in fourth grade as a new release, and it quickly became one of my favorites. It’s a child’s murder mystery, but don’t worry, it’s entirely appropriate for kids. Within, Chester the cat and Harold the dog are shipped off to a kennel called Chateau Bow-Wow while their family takes a vacation. Harold is rather enchanted with the place, but Chester, who as you may recall has a wild imagination and an affinity for Edgar Allen Poe, makes some dire predictions. Sure enough, the next morning Louise, one of the Chateau’s residents, has disappeared and evidence leads Chester to suspect murder. All the animals in the kennel are on Chester’s list of suspects. Max, Louise’s sporty bulldog boyfriend who’s been flirting with a prim little poodle named Georgette, is at the top of the list. He’d have the strength and the motive. But dimwitted mutt, Taxi–who’d do anything to please Max–isn’t off the hook. And neither is Lyle, the cat who believes himself a secret agent. Then there are the two howling dachshunds whom Chester is certain were cross-bred with werewolves. The human workers, college kids Jill and Harrison, aren’t above suspicion, either. Even level-headed Harold, the dog who recorded these adventures and submitted them for publication, is drawn into Chester’s crime theories. But the real story turns out to be far different than either dog or cat imagined. Holiday Inn is a fun story, a silly story punctuated with hilarious dialogue and dominated by two superbly developed animal heroes. I loved it as a child, and I loved sharing it with my kids. I recommend it. Approximately a first grade listening level and fourth grade reading level. Previous Indie Endeavors, Part 8: Should I Create a Paperback? I hadn’t heard of this. Thanks for sharing about it. Sounds like a fun read for elementary kids. Hi Michelle! I’ve shelved these books at the bookstore for years, but I’m ashamed to admit I’ve never read them. Thanks for the review. Sounds like a lot of fun! Oh, you should. They’re hilarious! Great review! You’re starting to make me want to read the series even though I (usually) don’t really like vampire stories. This one is just a mystery. No vampires. In fact, Bunnicula doesn’t even feature in this story. He stays with the neighbor while Chester and Harold are at the kennel. AH! WHEW no vampires. I love a good mystery! This looks like a very cute and humorous book! A good mystery is always fun. I’ve heard great things about “Bunnicula”, so perhaps I should look into this book too. We loved the first two. I just ordered the last two from the library. We’ll fit them into the final quarter of our school year. Great books for middle grade students. I enjoyed your review — sounds like this is a very funny story. I love Chester’s melodramatic character. Sounds like he keeps things stirred up. I would have loved this as a kid as I loved mysteries. It’s the characters that make this story. Not only do they display typical cat and dog behavior that every kid can identify with and laugh about, Chester and Harold’s personalities play off each other wonderfully!